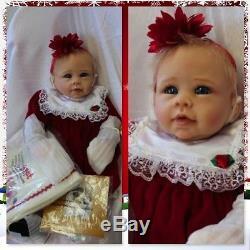 Ashton Drake Babys first Christmas doll by Linda Murray. At about 21 inches long, Babys First Christmas is superbly sculpted for the ultimate in realism. The doll and her accessories are so special, that she has been designated a Signature Edition Dollissued in a limited edition of only 5,000 dolls! This gorgeous baby is ideal for cradling close to your heart with smooth, tender RealTouch® skin and a face thats a vision of beauty, from her sparkling eyes and rosebud lips to the blush on her soft cheeks. Her darling face is surrounded by wisps of soft baby hair, and she has dainty fingers youll love to hold. As she rests comfortably in your arms, youll see she is a miracle of artistry just as adorably lifelike as she can be. 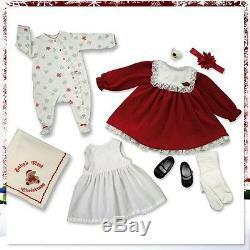 Your baby wears a lovely outfit created especially for her to make her first Christmas one to cherish always. Shes dressed in a red velvet ensemble adorned with a white satin collar, intricate lace trim and a pretty red ribbon rosette accent. On her hair shimmers a fabric floral headband to match the poinsettia print on her pacifier. Under the dress youll discover white tights and a white cotton slipperfect for your little lady! She also wears custom-made black patent leather shoes to add to the festive beauty. An adorable footed sleeper embellished with red and silver snowflakes, and a sumptuous blanket adorned with Babys First Christmas embroidery along with a darling teddy bear appliqué including a white fluffy pompom at the tip of his little cap! Create a delightful holiday presentation. Approximate length of baby doll is 21 inches. Decorative blanket measures about 24 inches. Please contact me if you have any questions and I will be happy to answer any that you may have. The item "Ashton Drake Babys first Christmas doll by Linda Murray" is in sale since Thursday, May 19, 2016. This item is in the category "Dolls & Bears\Dolls\By Brand, Company, Character\Ashton Drake\So Truly Real". The seller is "bebepourlavie" and is located in Beauharnois, Quebec. This item can be shipped to Canada, to United States.